Titan Drive is the foundation of Titan Reports and the bridge to TOTAL. Titan Drive will change the way you work. 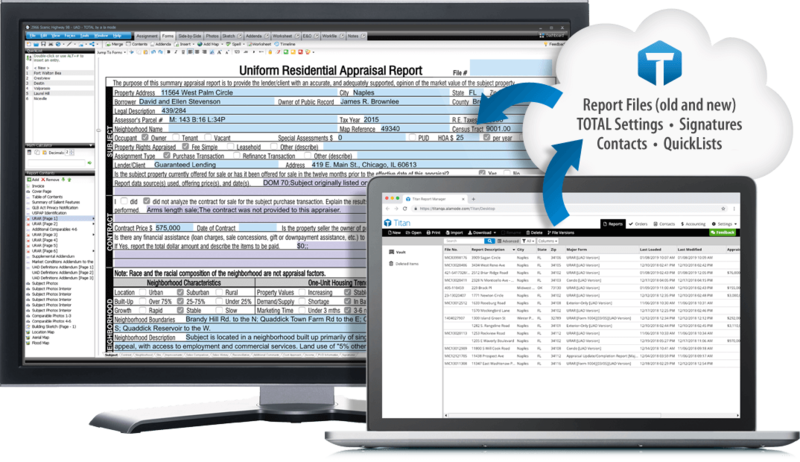 You’ll securely store your reports across multiple platforms, back up and access your user settings, and get unlimited file space. It's your key to Cloud Appraising. Titan Drive keeps all your reports, user settings, QuickLists, signatures, and more all in one place — making it easy to recover from a hardware disaster or upgrade to a new computer. If you have a newer version of a report in Titan Drive than you do in TOTAL, you’ll get a message to notify you. Just pull down the newer version from Titan Drive and continue working. Everything is available on your private cloud, so you're no longer tethered to a costly-to-buy-and-maintain infrastructure. Simply rely on Titan Drive to connect and support your workflow with no additional hardware. With Titan Drive, you won't have to manually save your reports to the cloud. When you're done, just save the report, close TOTAL, and it'll go to the cloud automatically. You've got years of appraisal reports to back up. So the sky is the limit. That means no more warnings about file space, and no need to buy additional space when you run out. Titan Drive is here! Keep an eye on your inbox for all the exciting details.